Click here for the current list of councillors and contacts along with their individual responsibilities. The agendas and minutes of Parish Council meetings have been available on the website for some time. Agendas for forthcoming meetings are published here and displayed on the Parish noticeboards no later than three working days before each meeting to comply with current law. The minutes from each meeting are published on the website in draft form as soon as they become available and will also be displayed on the noticeboards. However, we now have an ever-increasing document library, which is getting even larger following the implementation of the Local Government Transparency Code 2014, first published in May 2014, and which took effect from 5th August 2014. This means that almost all documents referred to at a Parish Council meeting must now be available for everyone to read. There may be occasional instances of documents not being available, or being redacted, for reasons of privacy, security or financial sensitivity. These documents will generally not be uploaded to the website until after the relevant Parish Council meeting. Some of these newly-available documents are in very large files so, for ease of access, they may have been split into manageable portions. Clicking on any of the following headings will open a new window from where you will be able to view any documents you would like to see. The Annual Return for the year ending 31 March 2018 is now available online for inspection. Copies are also on the main noticeboard at the Village Hall car park for a limited period. Accounting, Governance, External Audit and Internal Audit. Clicking on each title will make that section available. The External Audit report is not usually avalable until the Autumn each year. Small Grant Application Form - Did you know that local organisations and schemes can apply to the Parish Council for a small grant to help with funding? Most grants are aprroved in April each year and applications should be with the Parish Clerk by the end of the previous December for consideration. The Housing Needs Survey entitled 'Planning for new homes in Bourn Parish' (the date at the top of each page is NOT the survey date but the date it was printed out to be uploaded to the website). 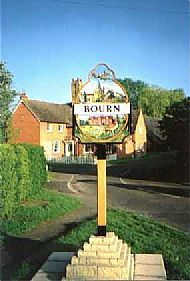 We have now uploaded copies of the statements made on behalf of Bourn Parish Council at the Examination in Public which is considering the Local Plan put forward by South Cambridgeshire District Council. The Local Plan has considerable impact on the proposed developments at Bourn Airfield and Cambourne West both of which are strongly opposed by the Parish Council. and also an article from the Cambridge News on 23 February 2015. Clicking on any of the above titles will allow you to read what has been said so far. The Examination in Public has not yet concluded. There will be further meetings of the Examination in Public in June 2017.